I hadn't played with these flavors in a while, but that has since changed - SO delicious! Cumin, paprika, ginger, cayenne & saffron plus many, many cloves of garlic. These pungent spices aren't just uniquely tasty, they improve cardiovascular function, possess antibacterial & antiviral properties, and several are natural pain relievers. Brussels & crispy chickpeas round out this protein and fiber-packed dish beautifully. 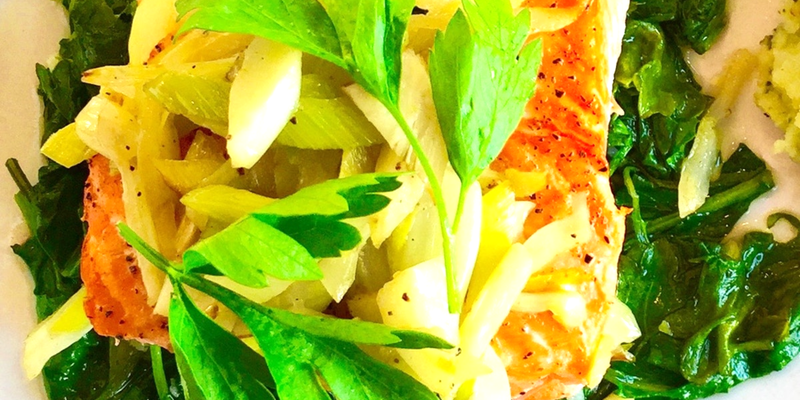 The richness of salmon, the fresh licorice-taste of fennel and a bed of garlicky spinach. A perfect summer meal. A fun bite-sized version of meatballs that my younger son loves (a feat, believe me). Crispy, garlicky, herby and totally delicious. Over sautéed greens or on their own with Spicy Tomato Sauce – a great meal for grown-ups that kids dig too.